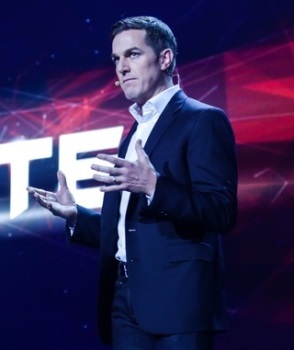 Electronic Arts' new CEO is Andrew Wilson, formerly the executive vice-president of EA Sports and Origin. Six months after the resignation of former CEO John Riccitiello, Electronic Arts has a new chief executive: Andrew Wilson, who joined the company in 2000. Prior to his appointment as CEO, he was the executive vice-president of EA Sports and Origin; he's also served as vice president and executive producer of the EA Sports FIFA Soccer Division, headed the EA studio in Seoul, Korea and led EA's Asia Online Publishing Group. "Let me start by saying I am deeply honored and humbled to become EA's CEO. I have a profound respect and passion for this organization, as well as for our global community of fans, and I'm incredibly motivated to serve our people, our gamers and our shareholders at such an exciting time in our industry," Wilson wrote in his first message as CEO. "I envision EA as the World's Greatest Games Company. This is not about what we are aiming for or what we will become. Rather, it is about an unfaltering commitment to what we will be every day," he continued. "This is an attitude that must drive our culture as one team." Wilson said his focus on the future will be on three things: "Continued transformation for our digital future, delivering amazing games and service across multiple platforms and instilling a culture of execution that will drive profitable growth." It's not exactly a surprising message - "We'll be awesome and make lots of money!" - but Wilson also indicated that he doesn't plan on making any hard turns right out of the gate. "I also believe EA's strategy is sound. Our focus on our talent, our brands and our platform together with our investment in next-generation consoles, mobile and PC free-to-play, as part of our ongoing transition to digital, is right," he wrote. "But we have plenty of work ahead to ensure our collective success." "I am convinced that Andrew was an inspired choice by our Board, and one I expect the team at EA will enthusiastically support," EA Executive Chairman Larry Probst said in his separate introductory message. "Andrew is the first studio executive to serve as our CEO, a testament to his blend of creative skills and business acumen. He is a compelling and charismatic communicator who cares deeply about organizational development, teams, and the individual careers of people who work for EA. Most of all, he has a powerful sense of respect for and commitment to our consumers." Probst added that he will remain as executive chairman for an indefinite period in order to support Wilson during the transitional period.